Bathroom or washroom plays a vital role in your daily life as it’s just not a place where you go to attend nature’s call or take a shower, it’s far more than that. We can redefine a bathroom as a thinking area where you spend time with yourself because this is the only place where you stay aloof from others. And, your bathroom can turn out to be the most relaxing place in the world if designed properly. There are plenty of ways to renovate and redesign your bathroom on a budget, thus transforming it into a relaxing and a cool space. Large format tiles are perfect for contemporary bathrooms and make smaller spaces look more spacious. Mosaics are also great as they mould themselves to the shape of walls and floors, creating an illusion of space with a designer touch. 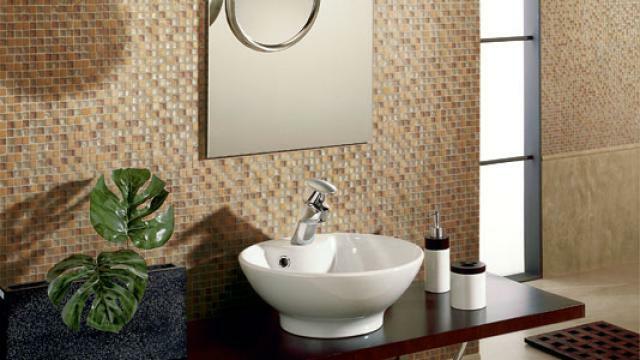 You can chose a wide range of bathroom tiles from the crisp, minimalist look to warm, subtle tones and textures, depending on your taste and obviously, your budget . You can chose the counter tops from the variety of granites, marbles, natural concretes, limestones, glass, etc. You can also go for travertine which is a sedimentary rock generally formed by mineral spring deposits, which give the stone its characteristic pattern. 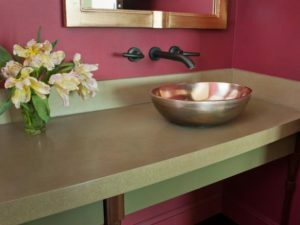 If you want to save money, then give your preference to laminate counter tops, often sold in ready made versions at home centers, and are affordable, durable, and available in a wide variety of solid colors, stone looks, and abstract designs. After a tiring day at work, pamper yourself by having a soothing bathing experience. This makes it more important to select the right kind of bathtub. The size, the color, the shape and the type, all can make a very big difference to your bathing experience. And, for those who have no limitations for budget, can definitely opt for Jacuzzi, which is a luxurious form of a bathtub. But, it only goes well if you have a spacious bathroom. You can give your bathroom a designer touch with the matching accessories. Coordinate your hang towels with the interiors of your bathroom. You can also add faux candles to your space in order to give a dramatic touch.